The San Antonio Spurs are not the greatest team ever. I am sorry, Golden State Warriors, for ever doubting you. I am very, deeply sorry I ever doubted you, Warriors. Jonathon Simmons of the San Antonio Spurs and Stephen Curry of the Golden State Warriors go for a loose ball at Oracle Arena on Jan. 25, 2016 in Oakland, California. This past weekend I was snowbound in central Virginia and decided to write roughly 1,000 words about a basketball game that hadn’t happened yet. I’d been assigned to cover Monday night’s matchup between the San Antonio Spurs and the Golden State Warriors, the most highly anticipated regular-season NBA game in recent memory, a game we were being told would be the best in the history of the league before it had even been played. So I decided to get an early start on writing about Spurs­–Warriors, the best game ever, which again, hadn’t yet happened. Earlier this season I’d written an article wondering if the then-undefeated 2015-2016 Golden State Warriors were the greatest basketball team ever. But sitting at home riding out a blizzard, it seemed to me—and, in my defense, my editor—that this had maybe changed. Since entering December at a more-than-respectable 14-4, the Spurs had gone 22-2, and were dispatching opponents in historic fashion. They have won 12 games by 25 points or more, already a franchise record. Going into Monday night’s contest, their average point differential sat at plus-14.5. The NBA record for a regular season is plus-12.3, set by the 1971-72 Los Angeles Lakers, who won 33 games in a row. The 2015-2016 San Antonio were, arguably, the greatest team ever. Golden State entered last night’s game at 40-4, still (well) on pace to catch the 1995-96 Chicago Bulls’ history-making 72-10 record. The Warriors are insanely good—the defending champions of the league, and by all statistical and observable indicators one of the greatest offenses in NBA history. And yet it is no longer clear that they are even the best team in 2015-16. Yes it is, Jack!!!! It is so very clear! You have to go back and not write that paragraph! It is a very bad and wrong paragraph! 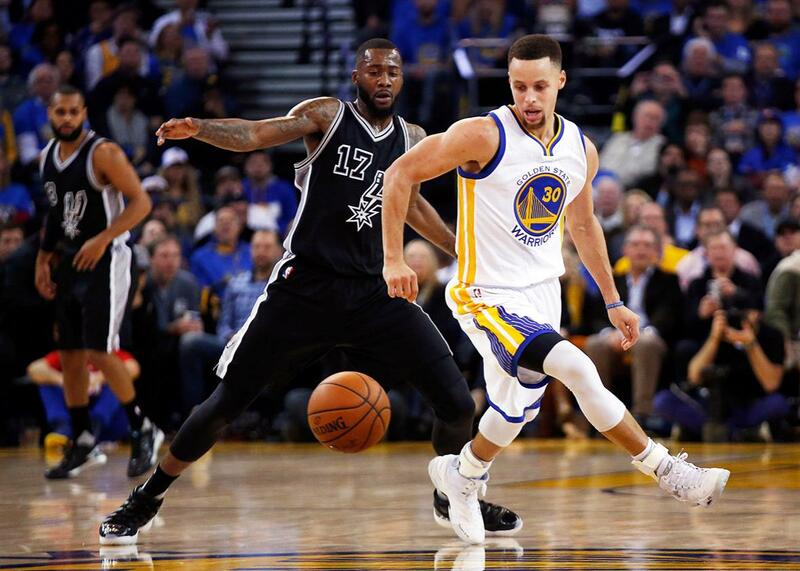 Back to the present: On Monday night, the Warriors demolished the Spurs, 120-90. A lot of times, writers will use a verb like demolished because it just sounds boring to use, say, beat or defeated. In this case, I’m using demolished because there is no other word that fits. Monday’s game was a complete and methodical demolition, one that left me embarrassed to have ever written those words above. The Warriors led by 6 after the first quarter, by 15 at halftime, and by 29 at the end of the third quarter. It was a display of dominance that led many an East Coaster, approaching 1 a.m., wondering when exactly it was acceptable to turn off the greatest basketball game in history. Sports, at any level at which people pay to watch them, are a hype machine. We’ll see this machine driven to its worst excesses in the runup to the Super Bowl, as we’re fed an endless stream of lies—that Cam Newton is unproven, that Peyton Manning is good—to ratchet up our anticipation for a game that probably won’t be all that close. It’ll all be obnoxious and garish, and we’ll hate it for that, and we’ll hate ourselves for the knowledge that we’re all going to gobble it up and watch anyway. The hype machine behind Monday night’s Spurs–Warriors game was quainter and more fun. For starters, the game started late at night for us easterners and was shown on NBA TV, a channel most Americans probably don’t know how to find. Sure, it had its hype machine, but at least one polite enough to appeal to connoisseurship. I don’t often stay up to watch basketball games that start at 10:30 p.m. on weeknights, let alone “for work,” and in the hours leading up to tipoff I started feeling kidlike levels of buzzy anticipation. I don’t remember the last time I’d been this excited to watch a mostly inconsequential game between two teams I don’t root for, in any sport. I’m not sure I ever had been. And then the game happened, and Stephen Curry dropped 37 points in three quarters against a Spurs defense touted as one of the best in history. Against the Warriors, that maybe-greatest-ever defense looked slow and overwhelmed, unable to stop Draymond Green from threading passes to his teammates for dunks and layups. There were several times that Curry made Kawhi Leonard—the reigning Defensive Player of the Year, one of the five best players in the sport, a player I’d written four entire paragraphs about over the weekend—look like a kid chasing his much older (and much shorter) brother around the driveway. The Spurs’ marquee free-agent acquisition, power forward LaMarcus Aldridge—about whom I’d written a mere two paragraphs over the weekend, albeit effusive ones—contributed about as much to his team as Tim Duncan, who didn’t play. The Spurs had been allowing an average of about 89 points per game; by the start of the fourth quarter the Warriors had already scored 95. As a writer this outcome was deeply frustrating; as a fan it was incredibly exciting. Both of these teams entered this game looking unbeatable. The Spurs, it’s easy to forget now, had come in winning 13 in a row, and were 55-9 against the Warriors since they drafted Tim Duncan. If Duncan had played on Monday, the Spurs’ record against Golden State still would’ve fallen to 55-10, but maybe the score would’ve been a bit closer—perhaps 120-94. The Warriors now, once again, look like something beyond unbeatable. Forty-one wins have never felt closer to 72, or even 78. Sitting here on the sleep-deprived day after the greatest NBA game ever, I’m not sure whatever made me doubt them. Maybe it was their recent losses to Detriot and Denver. Maybe I just needed a new story to tell myself. Maybe I’d gone snow-mad like Leo in The Revenant, a movie I still haven’t seen and will thus try to avoid writing about. As a sports fan, it’s great when games live up to their hype, but sometimes it’s just as interesting when they don’t.